It's almost upon us isn't it? Not long now! Are you ready? I must admit to being one of those infuriating people who are 'ready early'. This year, obscenely early. But you know, however early am I, however ready I think I am, December always has some surprises in store to keep me on my toes. December is always so, so busy! The schools have broken up too now, so along with the fabulous relief of not having to rush to get up in the morning (loving that! ), comes the task of Entertaining the Child. Now that my Little One is a little older (she's 6 now), a rather fabulous amount of things can be done that entertain us both at the same time. Little One made the square one in front, mine is the taller one at the back. I haven't made one of these since my own (distant) school days. She loved it of course and I probably enjoyed it far to much for a supposedly grown-up person but really, it was great fun! Today we both spent many a happy hour on our Decopatch kits. 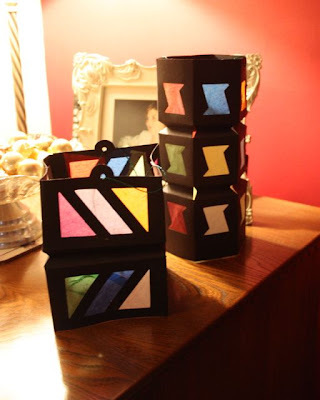 I don't know if you've ever come across the company, but if not have a look at the link above because I can really recommend it as a craft for all ages. My 6 year old was very able to cut her papers and merrily stick away with no help at all, and as for me... yep, I loved it too! 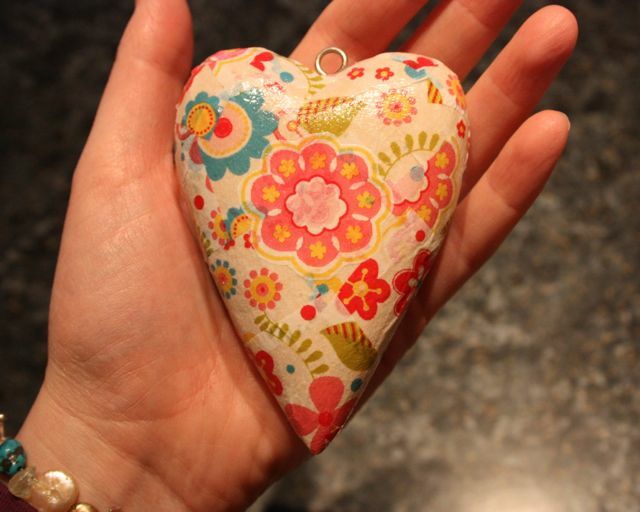 I finished my little heart quite quickly and really wished I had some more to do. It's very addictive! And here is my poppet's cat. We gave her little flower eyes and a nose. I love the patchwork look of Little One's cat, and I do think we'll be doing this again. Then, on to tomorrow. We have a witches broom to construct out of old wrapper paper tubes and some Melting Snowman biscuits to make. Don't they look awesome? That'll be good fun too. 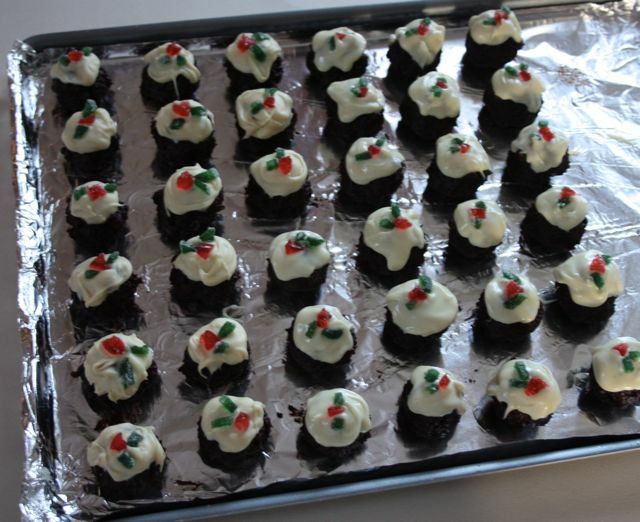 And at some point we'll be making a batch of these darling little Christmas Pudding Sweets from Nigella. I made these ones last year. 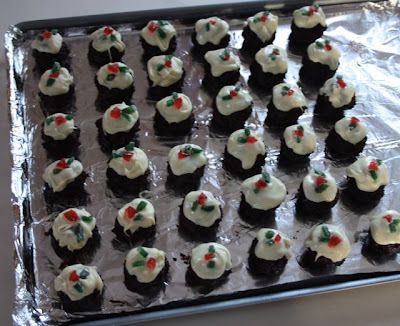 Mr P loves them and requests them every year. I'm pretty sure Little One will love to help this time! 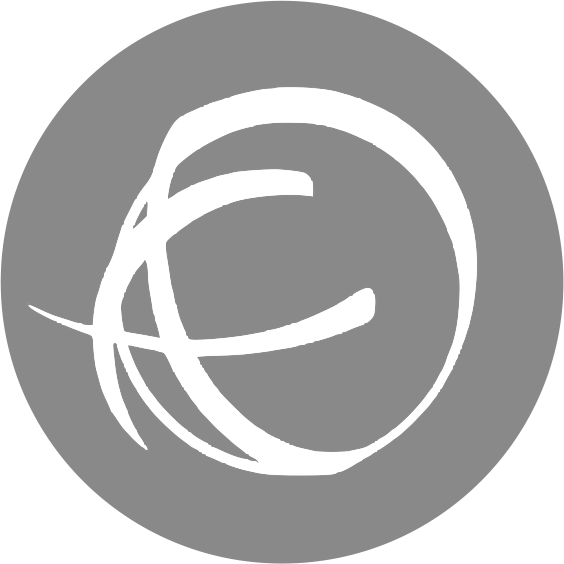 Well, with all that and more to keep us busy up until Christmas itself, I dare say I won't have another moment to chatter away to you all again for a while now. So, with very many thanks to all of your for your wonderful support and love this year, I shall wish you all a very merry and joyous Christmas and look forward to seeing you again in the New Year! 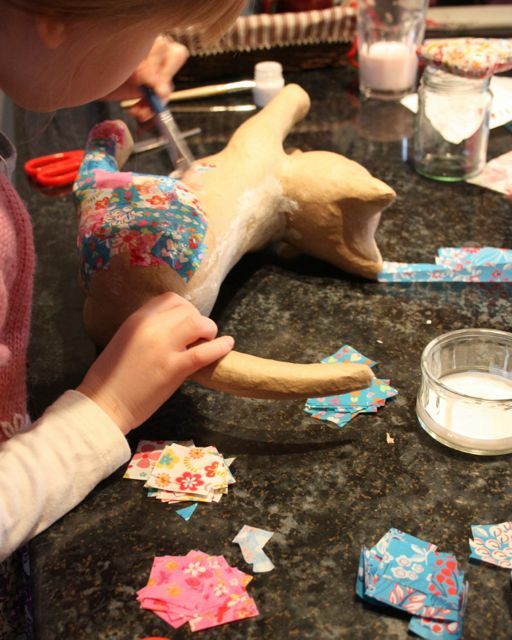 What lovely projects you and your little one have fun with! I rather like the Decopatch myself, and have a couple of things that would lend themselves to it. I might have a go over the holidays. 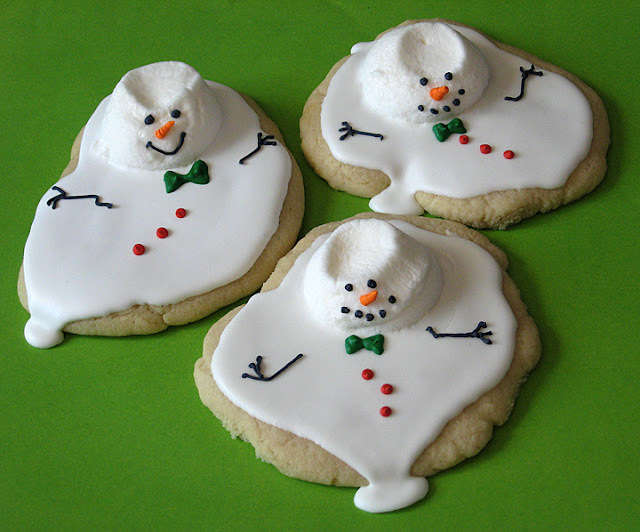 Just dropped by to wish you a merry christmas and am stealing the melted snowman bisc idea they are just too too cute. 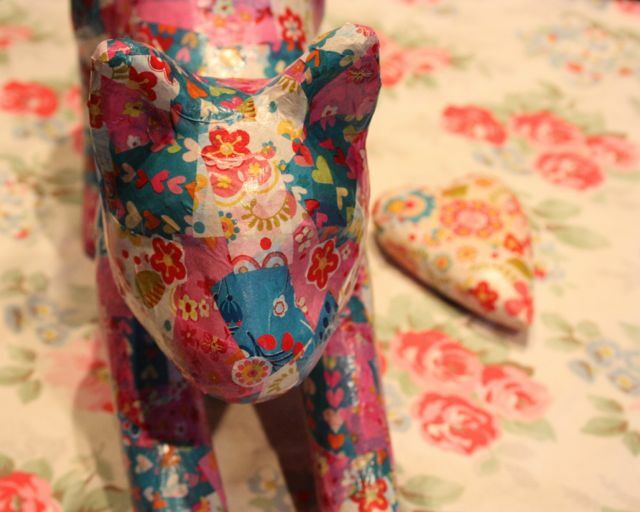 What a lovely way to spend a day decopatch looks completely addictive! All nearly done here too just wrapping shopping and more cooking to do! Crips I better get cracking. 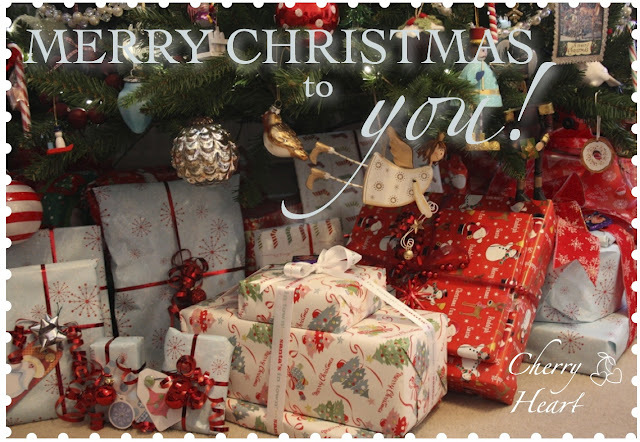 Wishing you a very lovely Christmas. I'm off to get mine sorted LOL. Hermosos trabajos y no se puede comparar los trabajos hechos con los hijos son los mas bellos y esas masitas !!! que tentación te mando un beso y te deseo una muy Feliz Navidad junto a tu familia Sandra. So cute cake! i love it. Good morning again! Told you I would be popping in again ...... 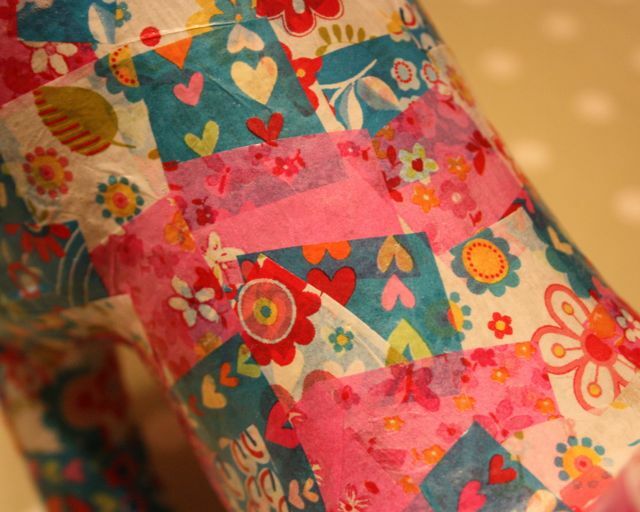 I LOVE DECOPATCH too! In fact in a few postings from next week I am going to show my little Gallery of Decopatch canvases. I recently did the lizard but I must get some of those hearts ..... they are gorgeous and would make a gift at any time of the year!